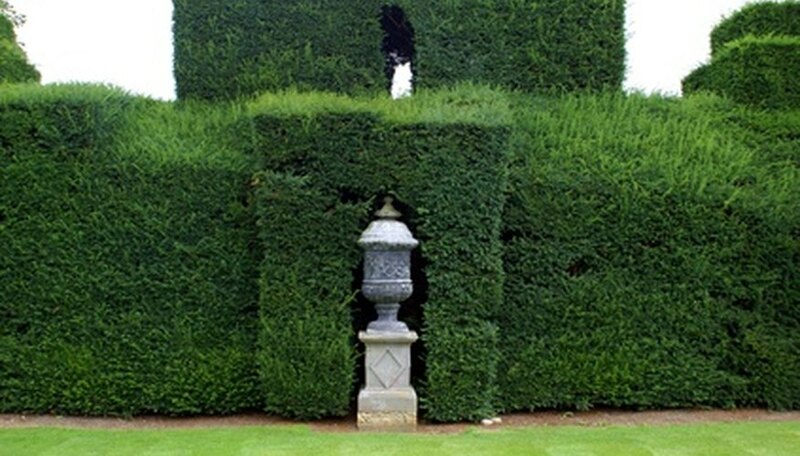 You can use nearly any kind of shrub to create hedges, but some are better than others depending on your landscape and how high of a hedge you desire. The best hedge plants are evergreen, providing year-round foliage for consistent privacy and interest. Select the correct hedge plants according to your climate, sunlight and soil conditions, as well as appearance preferences. Boxwoods are evergreen shrubs that can grow 15 to 20 feet tall with a dense, multi-branched form. Boxwoods offer dark-green, leathery leaves that are fragrant and about ½ inch to 1 inch long. The leaves tend to turn a slight bronze color during winter in colder regions. 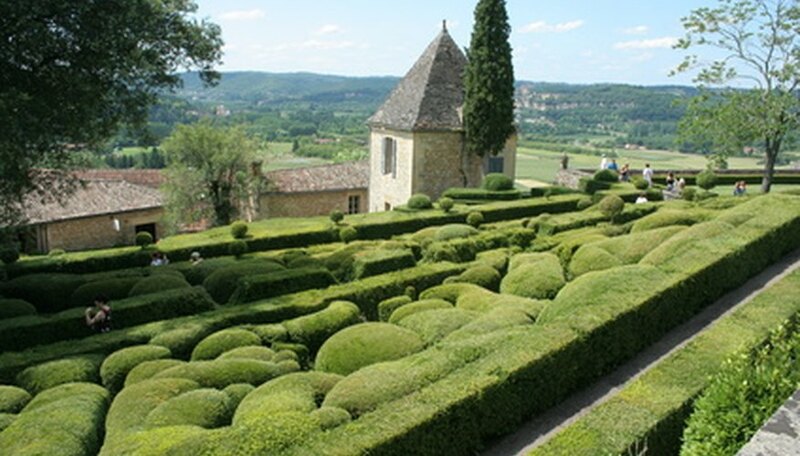 Because they're widely spreading, you can plant boxwoods as far as 10 feet apart to create a hedge. Plant the boxwoods in full sun to light shade, where they’re protected from cold winter winds and hot sun. Most boxwood cultivars cannot tolerate winter temperatures below -10 degrees F.
Yews are one of the best hedge plants for colder climates, the Canadian yew (T. canadensis) being the most cold-hardy (ideal in USDA zone 2). Canadian yews are slow-growing evergreen shrubs that reach only 3 to 6 feet tall with lush, dark-green, needle-like foliage. Creating an informal, low-growing hedge, Canadian yews can grow in either full sun or shade, enjoying moist but well-draining and sandy, slightly acidic soils. Japanese yews (T. cuspidata) grow 10 to 40 feet tall and wide with reddish-brown, scaly bark. The Japanese yew is hardy down to only Zone 4, tolerating winter temperatures as low as -25 degrees F.
The Chinese privet is an excellent low-maintenance shrub that creates a natural hedge of 6 to 8 feet in height. This hedge shrub has variegated leaves with mixtures of silver, green and yellow, as well as an ability to adapt to many different soil types. The Chinese privet is drought tolerant and requires little to no pruning. You can plant Chinese privets 6 feet apart in a row to create a hedge, either in full to partial sunlight. Chinese privets are best grown in warmer climates with mild winters that experience temperatures no colder than a minimum of 5 to 10 degrees F.
Native to Japan and hardy down to USDA Zone 4 (minimum temperatures of -25 degrees F), the Japanese barberry is a twiggy shrub that can create a 3- to 6-foot-tall hedge when planted 4 to 6 feet apart in a row. Although it’s deciduous, the Japanese barberry provides year-round beauty with fine-textured, bright-green leaves in spring and summer that turn orange, red and purplish in fall. In winter, the Japanese barberry has bright-red, showy berries. You can plant a hedge of Japanese barberries in full sunlight to partial shade and in a wide range of soil types. This shrub can tolerate drought and extreme heat, but it cannot withstand continuously wet or soggy soils. If you want to create a hedge or privacy screen quickly, the Thuja Green Giant is one of the best plant choices. This fast-growing evergreen tree can grow 3 to 5 feet in height each year, is drought tolerant and resistant to most diseases and insects. You can grow Thujas in nearly any type of soil and in direct or partial sunlight. 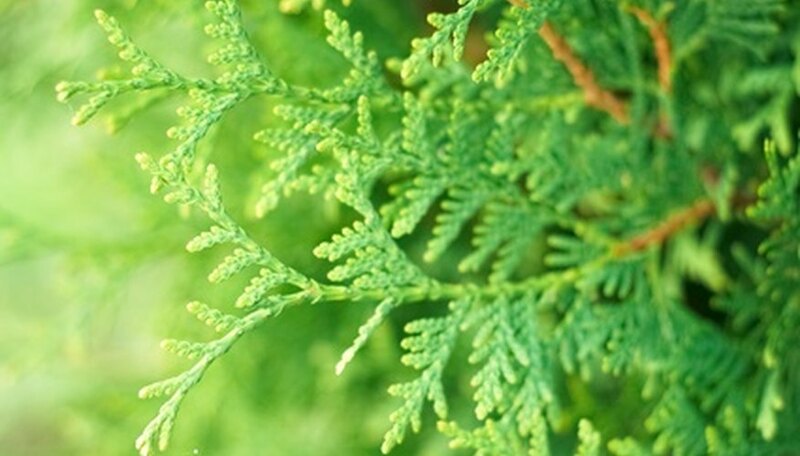 If you plant them 5 to 6 feet apart in a row, the Thuja Green Giants will create a 20-foot-high hedge, but you can also shear them each year to keep them at a desired height. Thujas can grow in USDA zones 5 through 9, withstanding winter temperatures down to -15 degrees F.
The Japanese holly is a dense evergreen shrub that grows 6 to 10 feet tall. Although slow-growing, the Japanese holly can create a solid hedge when planted 3 feet apart in a row. These holly shrubs can tolerate hard pruning or shearing, but requires planting in full to partial sunlight, in moist and slightly acidic soils, and in a spot that provides protection from dry winter winds. The best feature of Japanese hollies is the dark-green, shiny, lustrous leaves that are 1 to 2 inches long. This hedge plant grows best in climates where winter temperatures rarely get as cold as -15 degrees F.
Many junipers are appropriate for creating hedges, due to their evergreen foliage and easy maintenance. The common juniper (J. communis) is a shrub-like tree with wide-spreading branches that reaches 5 to 10 feet tall and 8 to 12 feet wide. Its needle-like foliage is grayish-green to blue-green with blunt tips. 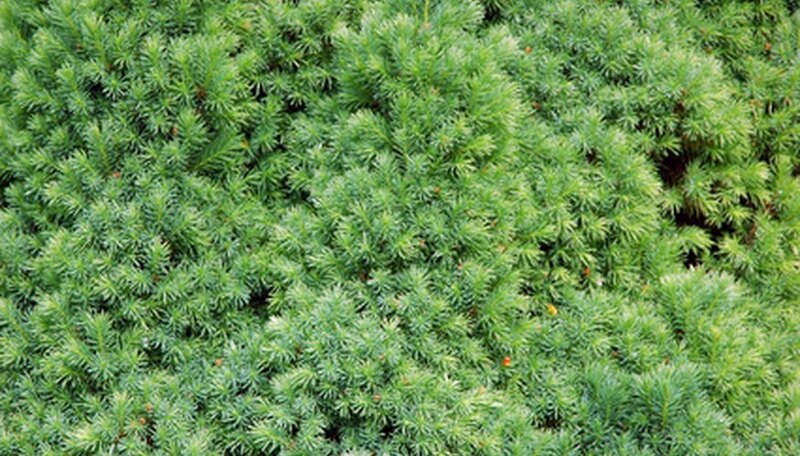 The common juniper produces 1/3- to ½-inch-wide, bluish-black cones with waxy blooms that are used in flavoring gin. To create a hedge, plant these junipers about 6 feet apart in full sunlight. Common junipers can grow in a wide range of soil types, even poor soils, and is tolerant of high winds. Rhododendron species are evergreen shrubs with an added bonus, their showy, large flower clusters in shades of pinks and purples. The Catawba rhododendron (R. catawbiense) is especially good for creating hedges, growing 6 to 10 feet tall and wide with leathery, dark-green leaves. The lilac to magenta, 5- to 6-inch-wide flowers bloom in mid- to late May. Nearly all rhododendron species prefer moist, cool, acidic soils and partial shade to full sunlight, tolerating winter temperatures well below freezing. 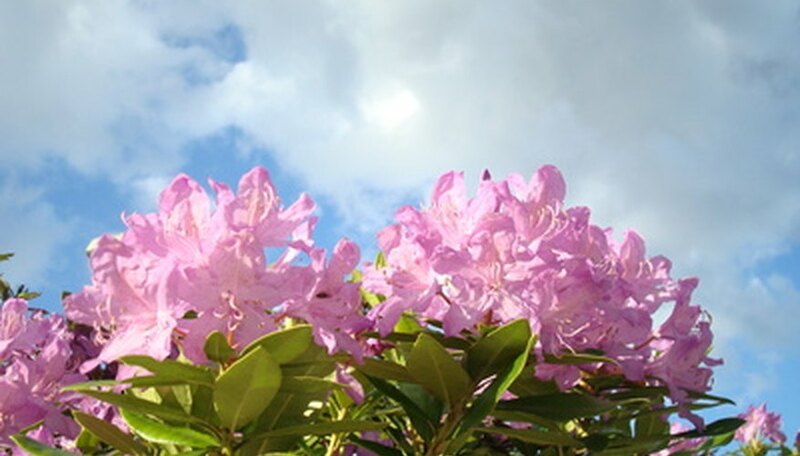 Azaleas are also species of rhododendrons and can create flowering hedges, but nearly all are deciduous. Although a deciduous shrub that won’t provide a solid hedge year-round, the Rose of Sharon is a flowering shrub that grows 8 to 10 feet tall and 6 to 8 feet wide. This flowering shrub has medium- to dark-green, 2- to 4-inch-long leaves that are coarsely toothed and often glossy. 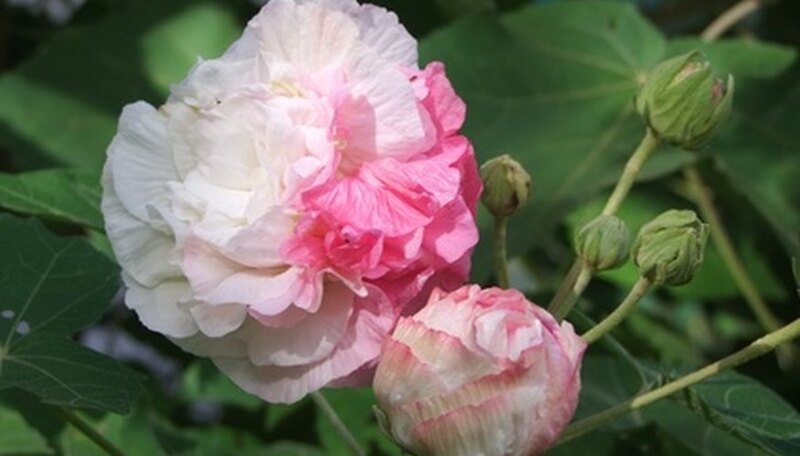 The best feature is the Rose of Sharon’s large, showy flowers that bloom in shades of white, pink, magenta, blue or violet in July through September. You can plant these shrubs about 4 feet apart to create a hedge in full-sun areas of your yard, in nearly any soil type. Rose of Sharon plants are hardy down to -15 degrees F.
When to Trim Japanese Boxwoods? What Plants Make the Slimmest Hedges?